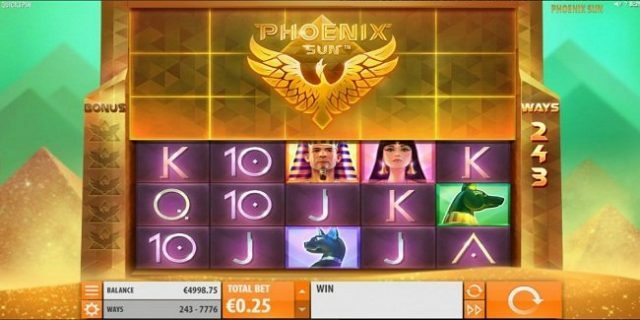 Phoenix Sun is an online video slot game presented by Quickspin software platform. This slot is of 5 reels and 243 paylines which offers a decent jackpot. Coin size for the game ranges from 0.25 to 100 per spin and return o player percentage is 96.08%. This particular slot game is inspired by Egypt and their culture. The reels are being set against the backdrop of pyramids and are set on a huge gold plate. You can play this slot game at any Quickspin casinos for free or with the use of real money. Before you start playing this game, you should check out some options that this slot contains like “Total bet” which is used to change the coin size, ‘Spin” button which is used to start the game and “Auto Play” option which is used to turn the reels in motion without any interruption for a chosen number of times. This game includes wild symbol as well as other symbols. Golden plate is the wild symbol here in this game which can be the substitute for all other symbols excepting the Phoenix wild. The Phoenix wild symbol will trigger Phoenix Rising Re-spins feature. Every time Phoenix wild feature appears on active reels, it will remove 3 random tiles from the cover above 3×5 reel grid. If you collect Phoenix wild, you will collect free spin feature. You can win up to 8 free spins during this feature.